My Blog’s Family Tree – Yours? The advantage of using Touch Graph to map out your linkage is that you can add other URLs and watch the complexity happen as layer upon layer of relationships become visible. This image, though, is just my URL before I add layers. Anyway. I showed you blog’s family tree. Now you show me yours. Grokker is also good if you want to map out key words. 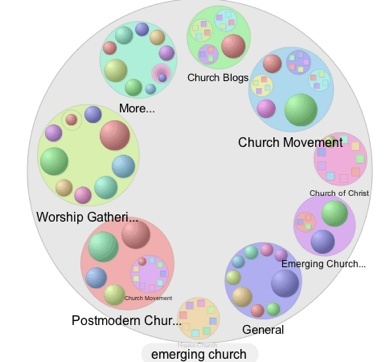 I have been grokking the emerging church at intervals to track changes. Try it yourself. Go here and then choose the “Zoomable Map” button on the left. Heres how it looks this morning. nice one – have added a map over at my blog… the usual suspects crop up! thanks for getting me started on this blog adventure. Thanks to Jonny Baker and TallSkinnyKiwi for guiding me to the very coolTouch Graph Google Browser. 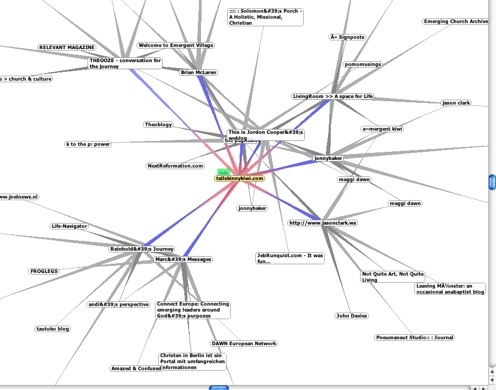 This site creates a visual map of your blogs relational network. Very coooool. Thanks for sharing!